I searched Google for how-tos and found 21 year-old YouTuber “Made You Look By Lex,” a licensed cosmetologist and makeup artist with a brand (YouTube: 832,615; Instagram 169,000; Facebook 262,975). 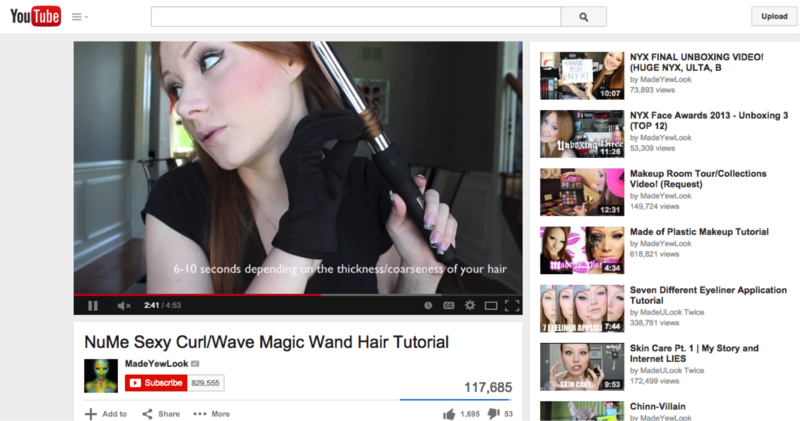 In the 4:30 video (118,000 views) she showed me how to use the “NuMe Magic Wand” to get my va va voom locks. I was thrilled, and I was sold. This got me thinking about the power that influencers have over the marketing funnel. Lex has created her brand by refining her identity, tone and voice using social channels and platforms that bring her authentic story to the masses. She knows what’s cool and has an engaged community the size of San Francisco to prove it. She is a microcelebrity. This notion of blurring lines between celebrity and “regular people” is ubiquitous in social media. Millennials know how to turn themselves into brands, and for those who do this well enough on Instagram, YouTube and Twitter, become microcelebrities. It turns out; the microcelebrities have just as much pull as the Charlize Therons, if not more. They create more engagement among their audience, and are more relatable and willing to incorporate a brand into their social media. According to Socialbakers, the average post engagement for a brand with 100k-499k Facebook fans is 0.19%, well below Lex’s threshold. This scenario underscores Lex’s ability to authentically captivate and connect with her audience at scale with far greater success than the brand, and it is for this reason Influencers are more valuable than ever. For many brands, borrowed equity is critical. The recommendations and products they choose to align with mean something to their followers. Identify a network of Influencers that share similar passion points and interests and that best align with your brand. Understand their unique aesthetics, skillsets, and areas of influence. In partnership with your Influencer, create content that is tied together by a common theme. The result is an authentic and naturally compelling campaign that resonates with the Influencer’s audience while delivering a big payoff for the brand. Seed your Influencer network with beautifully curated content. You can share your content through pins on “Pinterest Storyboards” created by your Influencer. The Storyboard is a blend of unique pins that visually tell a story to your followers and the Influencer’s engaged audience. Part 2: In part two of this blog, I will show a case study or two where an Influencer partnership campaign delivered successful results.